Fred Olsen Cruise Lines offer a number of cruises from Southampton in 2019, 2020 & 2021 to destinations throughout the world. Fred Olsen is our favourite "Small Ship" cruise line. Yes, her fleet is slightly older than some of the more modern cruise ships, but that is what makes Fred Olsen so special to our clients. The Olsen family's sailing experiences go back over 150 years – and that shows in everything they do. Their ships have all the facilities you would want, but are small enough so you always feel comfortable and at home. Fred. Olsen's crew are consistently praised by Cruise Village clients and Fred Olsen's family managed business works hard to make your trip special. So what are you waiting for? Hop onboard Balmoral, Braemar, Black Watch or Boudicca for a cruise of a lifetime. SAVE in Fred. 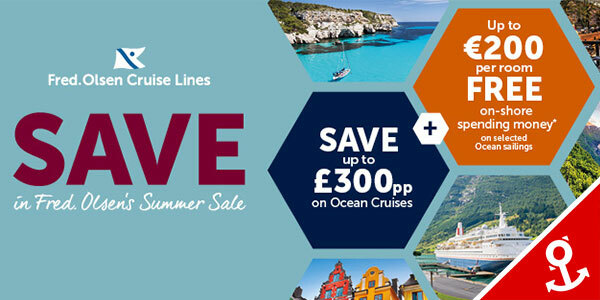 Olsen's Summer Sale and discover your choice of remarkable destinations for even less, with special reductions on a selection of June to September 2019. With a rage of tantalising ocean itineraries included in the sale, so you're sure to find an adventure that tempts. Plus, on selected cruises, Fred. Olsen will give you up to €200 per room FREE on-shore spending money too, to help you get the most from your holiday. Marvelling at the masterpieces of Gaudi in Barcelona and Picasso in Malaga; seeing Provence's fragrant lavender fields in full bloom; uncovering the cultural and architectural gems of beautiful Baltic cities, such as St Petersburg and Tallinn; and much more - you can experience it all with Fred. Olsen, taking advantage of fantastic reduced fares, if you book by 3rd July 2019. Book a selected sailing by 23rd April 2019 and receive FREE Drinks! Join Fred. Olsen on board on of their smaller, friendlier ships and get closer to some of the world's very best destinations and experiences on unforgettable cruise holidays this summer! You can view all of Fred Olsen's Cruises from Southampton in the list below. If you would like to view the itinerary and latest fares click the blue 'View Details' button. If you would like more information and the latest availability click on the red 'Enquire Now' button. Alternatively you can call and speak to a member of our dedicated cruise team on 02380 658 386. Book by 23rd April for FREE Drinks package onboard! Save in Fred. Olsen's Summer Sale! T&Cs: Easter Weekend Sale: Free drinks offer is applicable on selected 2019 sailings, as indicated, for new bookings made from 18/04/19 to 23/04/19, inclusive. Easter Weekend Sale offers are subject to availability and are capacity controlled. Ocean cruises only: Dining sitting will be allocated at FOCL discretion, and will be advised within the cruise ticket. Saver Fare guests can choose a specific dining sitting at the time of booking for a supplement of £2.00 per person per night; Table sizes cannot be requested when booking a Saver Fare. All promotional discount has been taken into consideration. Fares are based on two full paying adults sharing the lead grade of stateroom. Promotional details, fares and itineraries were correct at time of publish but can be changed/withdrawn at any time without notice. E&OE.